Sponsor a music stand banner for the band! We are excited to add a special touch to the appearance of the band in the summer of 2010. The banners are custom made in England, embroidered with the official band logo and sewn especially to fit the stands. Each banner has a price of $60 US. 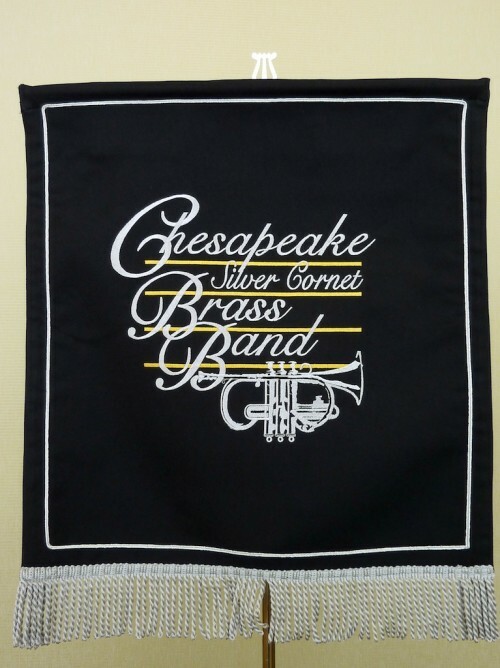 To sponsor a banner for the band send a check or money order in the amount of $60 for EACH banner you wish to sponsor to Chesapeake Brass Band, Box 172, Hockessin, DE 19707 with a memo indicating that you are contributing to the banner campaign. Your sponsorship is tax deductible. We do advise you to check with you tax professional for full details. Please include your name and address. We will create a label with your name as sponsor and attach it to the reverse of each banner you sponsor. We will send you a certificate acknowledging your gift. With your permission, we will list you as a sponsor in our banner campaign on our website.